Walk 130 was not recorded. Walk 132 was not recorded. Walk 134 was not recorded. Walk 137 was not recorded. 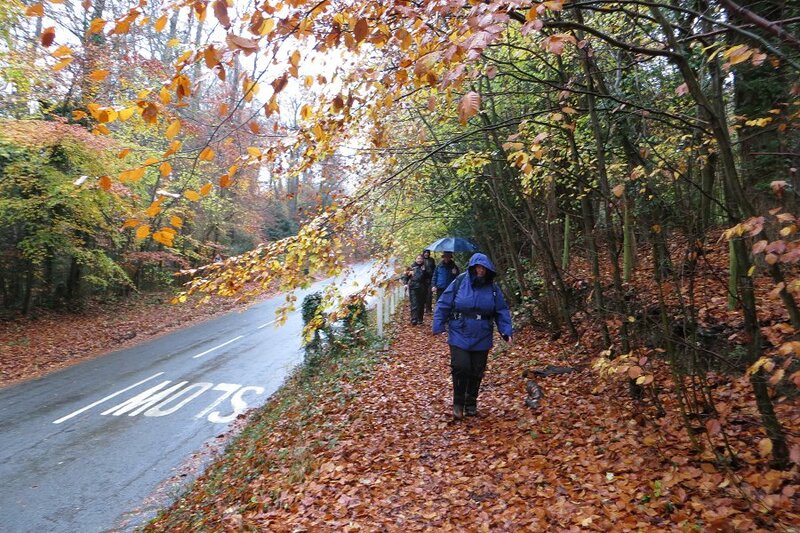 A rainy Thames Path near Hurley. After a remarkably warm and dry September, the weather has become a bit more average for the time of year. Unperturbed by the rain, seven of us, including one newcomer, gathered in the free car park at the end of Hurley High Street for an 8½ mile walk. We set off northward and straight over a footbridge across the River Thames. Passing Hurley Lock, we crossed the river on another footbridge and followed the Thames Path eastward. Not for long though, as we took footpath heading away from the river and then another one heading west, past a field with lamas in it. The path emerged onto Hurley High Street, just a short distance south of where we'd started! Hall Place and the Berkshire College of Agriculture. 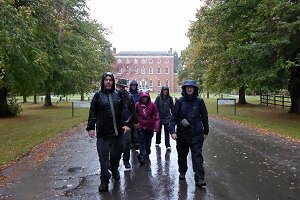 Continuing south we splashed our way along the High Street, crossed the A4130 Henley Road and then began ascending Prospect Hill - one of the two hills on this walk. Passing through a small section of woodland and then more fields, we entered the grounds of the Berkshire College of Agriculture and the rather grand looking Hall Place. 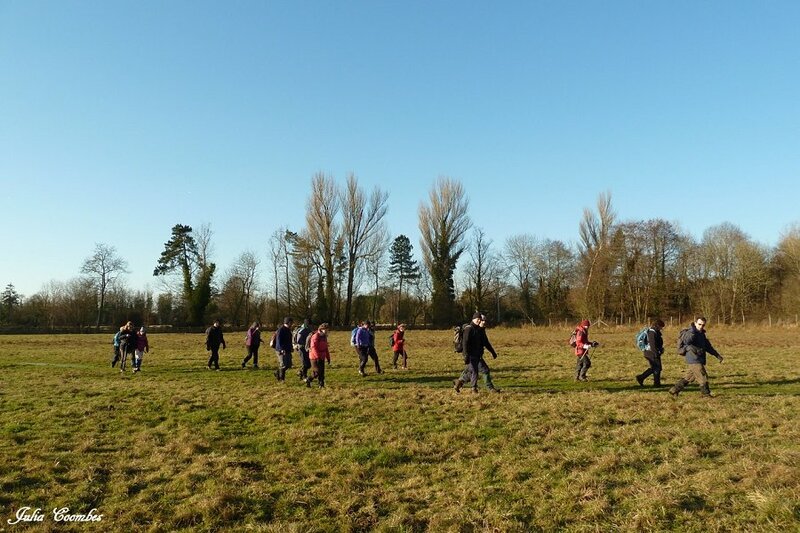 Leaving the grounds, we took a footpath across a sports field into the tiny village of Burchett's Green, where we joined the Chiltern Way heading west towards Ashley Hill Forest. As the name implies, there was a hill, which we ascended and stopped at the top for our picnic lunch. A wooded footpath north of Juddmonte Farms on the way back to the Thames Path. When the picnic was over, we continued west, descending into the hamlet of Warren Row where we stopped off at the Snooty Fox pub for a drink and a dry off. The rain began to ease off and was just a fine drizzle by the time we left the pub. Next we left Warren Row on a footpath heading north through the Juddmonte horse-breeding farm. The path skirted some of the paddocks and then woodland before emerging onto the A4130 Henley Road, west of Hurley. Crossing the road we continued north on another footpath until we reach the River Thames again. We followed the Thames Path eastward, back to car park in Hurley. The rain had stopped and the sun came out on the journey home! See our route on Bing Maps. 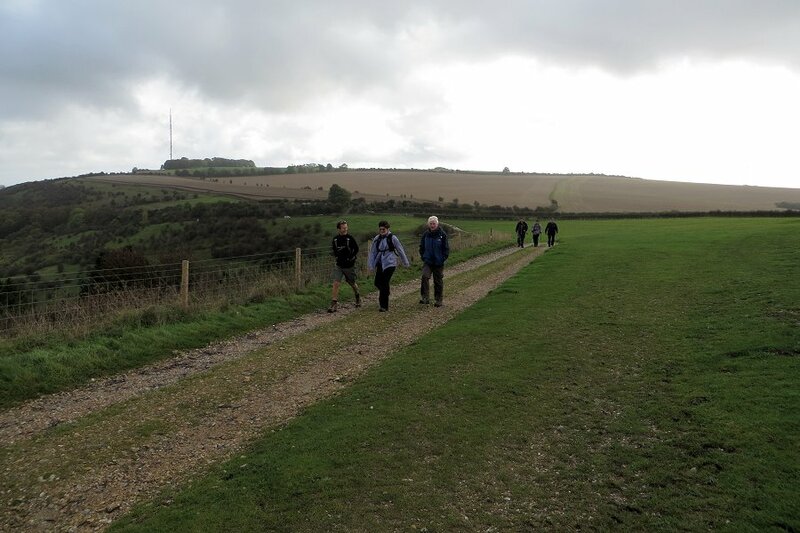 Starting our walk along The Ridgeway at Overton. Sunday 12th October started off misty and remained overcast for the day, but that didn't stop fifteen people turning up for this joint walk with the Berkshire Walkers 20s & 30s group, in and around Avebury in Wiltshire. 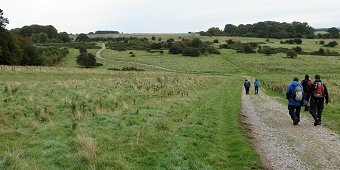 We set off along The Ridgeway, an 87 mile National Trail that starts at Overton Hill, where we were parked, and eventually ends at Ivinghoe Beacon in Buckinghamshire. 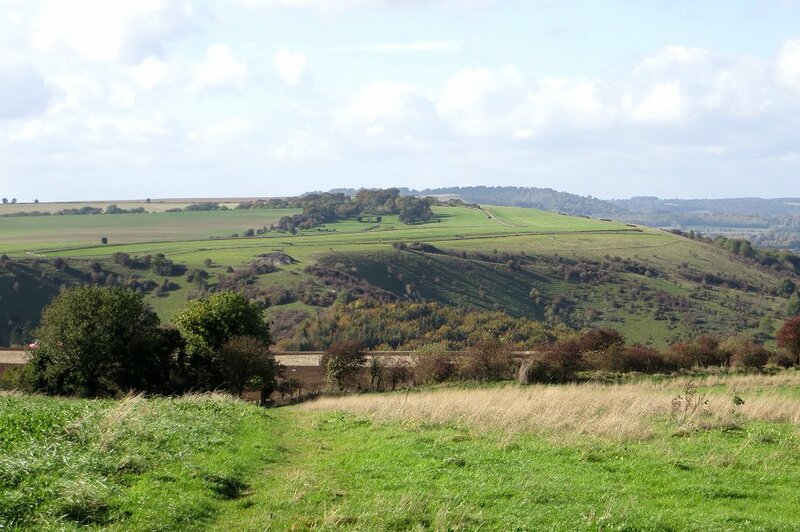 We did the first two miles before diverting to the east and into Fyfield Down nature reserve. Making our way through Fyfield Down national nature reserve. A curved route through the nature reserve took us along sections of the Wessex Ridgeway and the White Horse Trail before returning us to The Ridgeway, about a mile north of where we'd left it. Next we descended Monkton Down, heading south-west through farmland and onto the Wessex Ridgeway again, which we followed for about half a mile into the village of Avebury. We stopped for our picnic lunch on the outskirts of the village, by the outer ring of standing stones. Descending Monkton Down, heading toward the Wessex Ridgeway and Avebury. Once we'd finished our lunch we walked into the centre of the village. A few of us stopped for a pint at the Red Lion pub while the rest went to the National Trust Café for coffee, tea and cake. 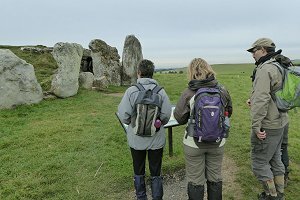 Refreshed, we took a tour round the standing stones before leaving the village on the White Horse Trail, heading south, following the River Kennet. This took us close to Silbury Hill and over the A4 (the same road that goes through Reading) where we took a detour up to West Kennet Long Barrow. 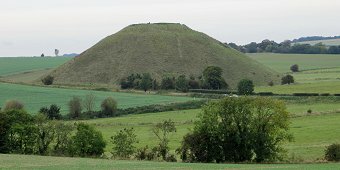 A view of Silbury Hill from West Kennet. The A4 road can be seen passing in front. After a quick look at the information board, some of us went inside the barrow for a look around. It consists of several chambers off a central isle, with just enough room to stand up, if you're not too tall. The view from on top of the barrow was also quite impressive. We re-joined the White Horse Trail, roughly following the River Kennet eastwards. 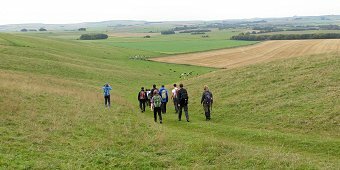 We passed nearby West Kennet Farm and East Kennet village, along some particularly muddy paths, before heading north to The Sanctuary. Looking at the entrance to West Kennet Long Barrow. This is a site where once was a large wooden henge, made of two concentric rings of pillars, their tops bridged by wooden cross-pieces. Nothing original remains, but there are markers to indicate where the pillars had been, and an information board with an artists impression of how it might have looked. After a quick look, we crossed the A4 to the Overton Hill car park where we had started the walk. See our route on Bing Maps. A cloudy start to the walk. 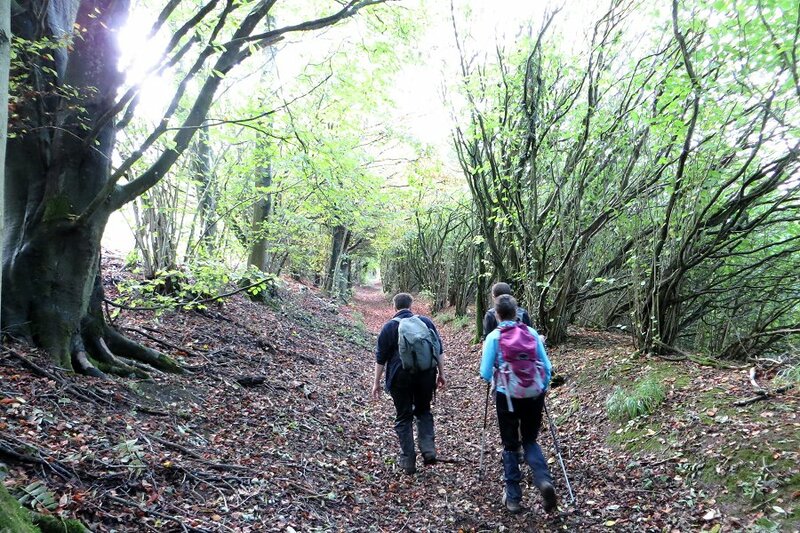 We're on the Wayfarer's Walk heading west from White Hill. 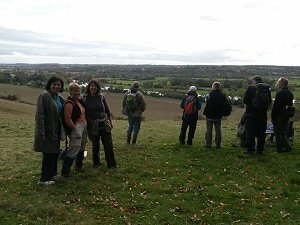 Eight of us turned up on Sunday 19th October for a figure-of-eight walk around Kingsclere, Sydmonton and Hannington. We had four BWW regulars and four guests from other walking groups. 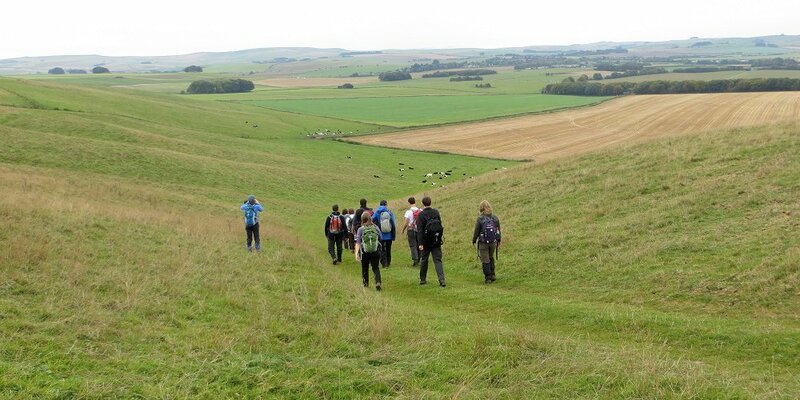 This walk was designed to provide a choice of an 8 mile or a 13½ mile walk. All eight of us did the first leg and four of us also did the second leg. 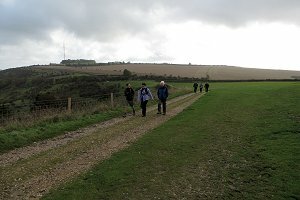 It was a bit grey and cloudy when we set off from White Hill, heading west along the Wayfarer's Walk, a 71 mile long distance path connecting Inkpen (Combe Gibbet) in West Berkshire with Emsworth on the south coast of Hampshire. Walking through the picturesque hamlet of Sydmonton, owned by Andrew Lloyd-Webber. 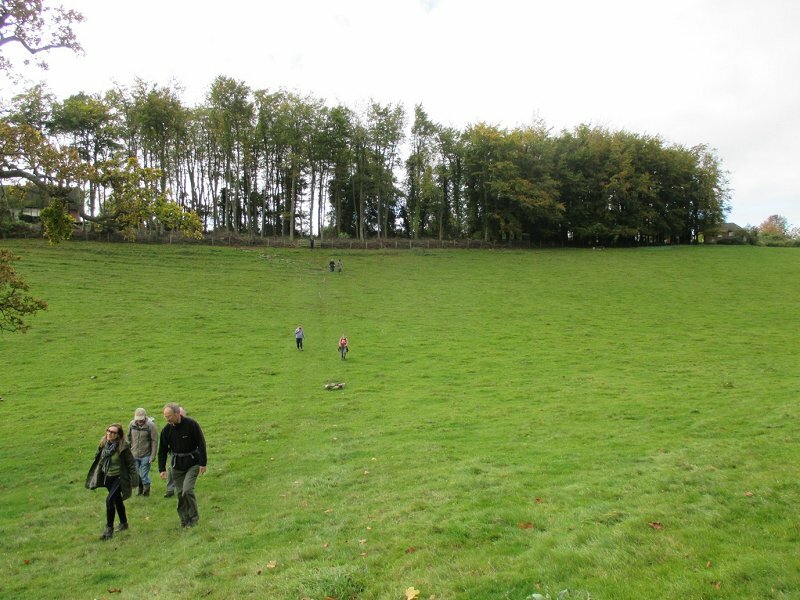 We passed through the gallops, belonging to the Park House Stables, before continuing along the top of Watership Down. 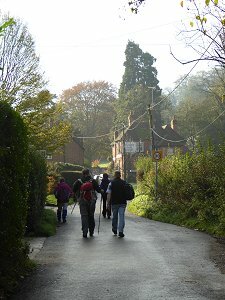 After crossing the finishing line of an uphill cycle race on Nut-Hanger Down, we left the Wayfarer's Walk and descended along a tree-lined path to the picturesque hamlet of Sydmonton. The 5000 acre Sydmonton Court estate, which includes most of the land we were walking on in the first leg of our walk, is owned by Lord Andrew Lloyd Webber. Amazingly, we came face to face with him as we walked past the gate to the Tudor mansion house. He smiled and gave a friendly nod, as did we in return. 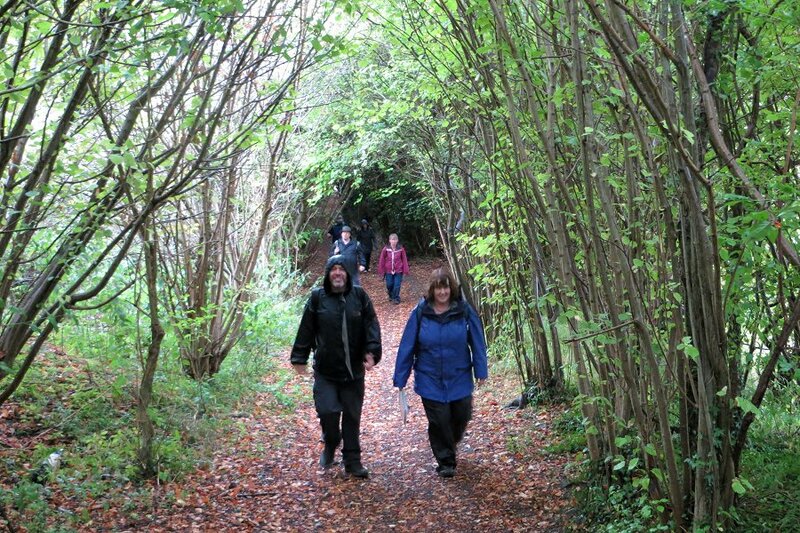 Ascending the woodland path up to Ladle Hill. 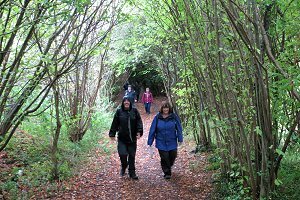 Looping round past Wergs Farm, we began our ascent along a woodland path up to Ladle Hill where we re-joined the Wayfarer's Walk. With frequent views of the nearby Beacon Hill, we also caught a glimpse of Highclere Castle, where Downton Abbey is filmed. We could only see the tops of the towers, as this Jacobean house is surrounded by tall trees. After passing the earth works of the Iron Age hill-fort and tumulus on Ladle Hill, we stopped in a field to have our packed lunches. Although the weather was sunny and quite warm for the time of year, it was rather windy on top of the hill, with plenty of Autumn leaves flying past us as we ate our sandwiches. 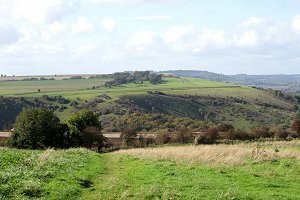 White Hill and the Wayfarer's Walk as viewed from Cottington's Hill. After lunch we continued heading east along the Wayfarer's Walk, retracing part of our outbound route, back to White Hill. 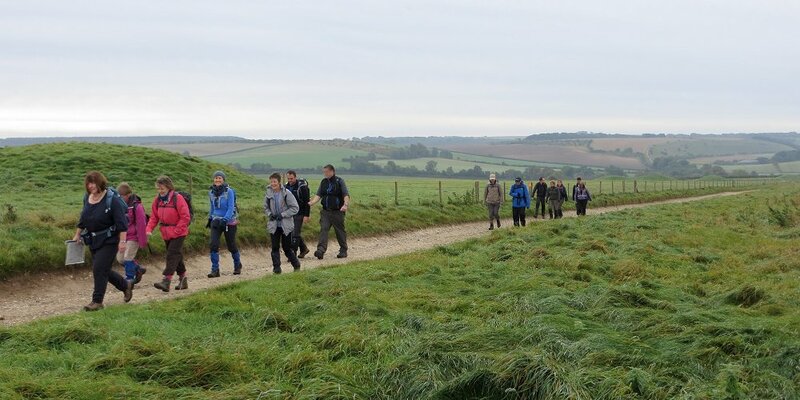 On reaching the car park, half of the group decided to go home having completed the first leg of the walk, whilst the other half continued onto the second leg. We soon diverted from the Wayfarer's Walk to head up Cottington's Hill, from where we could look back that the route we'd taken on the first leg of the walk. 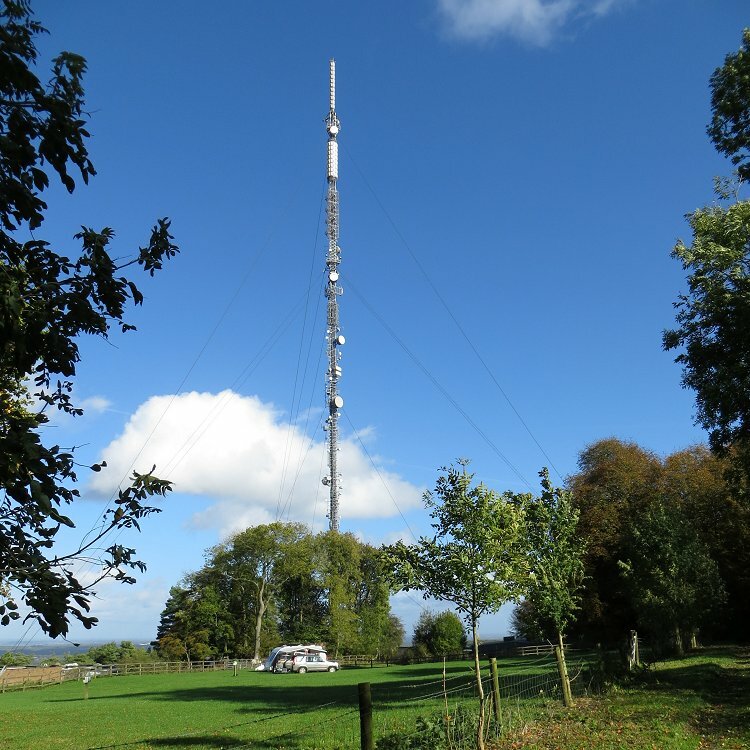 The TV mast and small caravan and camping site at Cottington's Hill. Cottington's Hill is home to a small caravan and camp site, and to the mighty Hannington transmitter mast, that provides television reception to north Hampshire and Berkshire. After passing the mast, we followed a quiet lane, heading south through Freemantle Park Farm and then followed a footpath that emerged by the church and village green in Hannington. We stopped off at The Vine pub for a drink before continuing south to the tiny village of North Oakley, where we re-joined the Wayfarer's Walk. 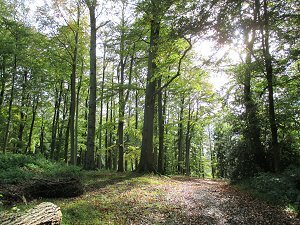 We followed the Wayfarer's Walk, north-west through woodland and farmland, back to the car park at White Hill. See our route on Bing Maps. Today's walk only covered about 7 miles of this long-distance path although we have explored other sections on previous walks, and there's plenty more of it for future walks. Stopping for our picnic lunch in Bottom Wood. On Saturday 25th October whilst some of our group had ventured to Cornwall we successfully managed to lead this 8½ mile walk around Caversham, Collins End and Mapledurham which we had to cancel on the first attempt back in January 2014 due to the River Thames being dangerously flooded and torrential rain. 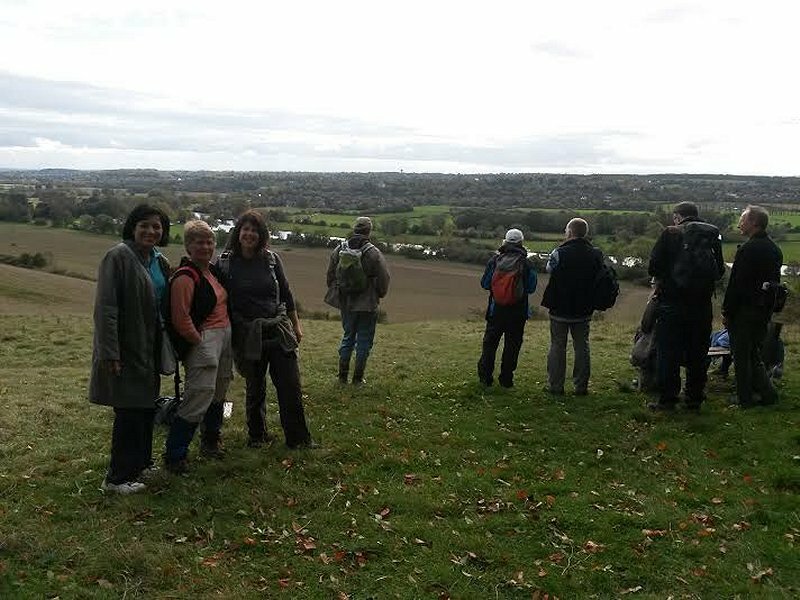 Sixteen turned up for the walk including several new people and a few from other local Ramblers walking groups, one of which was a near-by resident who knew interesting facts about the area to share with the group. 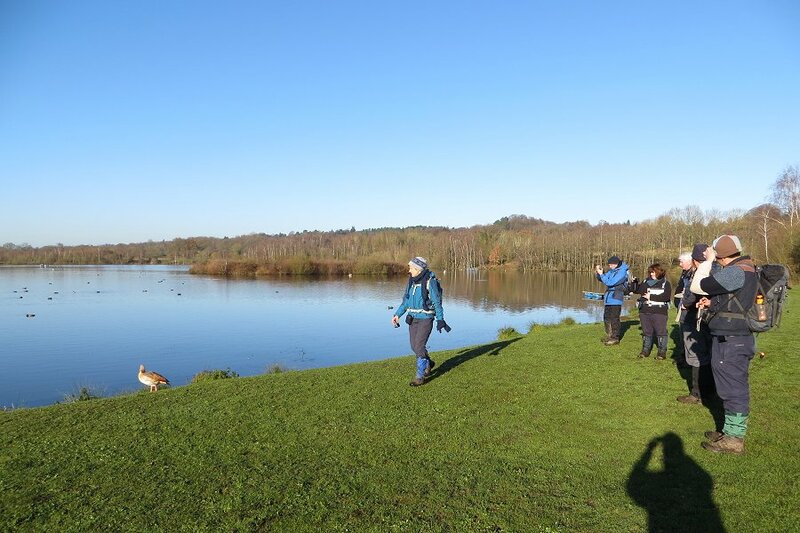 The weather was unusually mild and sunny which was nice after the disappointment in January. 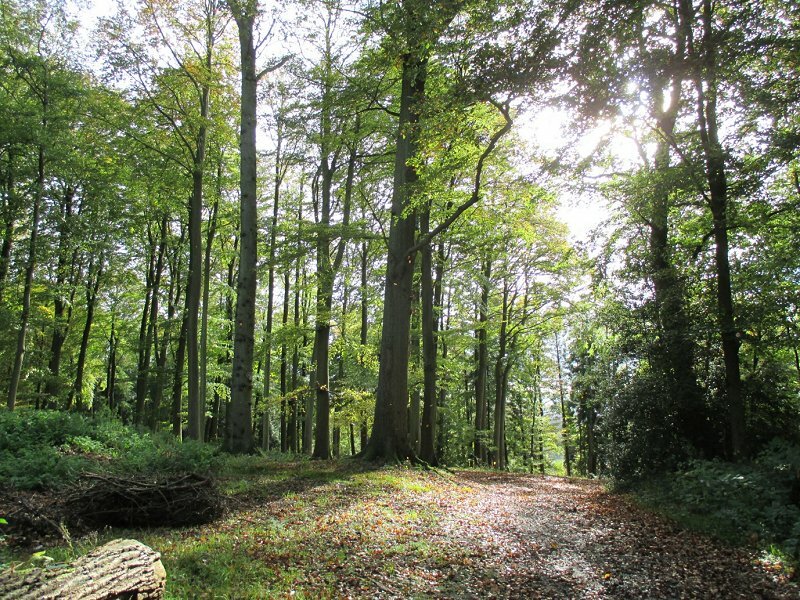 An autumnal scene in Bottom Wood. We headed off from the Mapledurham recreation ground heading west along the Upper Woodcote Road before turning off down a track near Blagrave Farm and suddenly into the countryside away from the urban buzz of Caversham. We passed next in a north-west direction changing course several times making our way through the Caversham Heath golf course. Eventually we came out on a reasonably long stretch of concrete track where we had to carefully avoid a fair amount of traffic which had not been expected. It transpires it was all heading to a Christmas craft and gift fair at Mapledurham House. Having checked the web site as an aside this actually sounds like it may be quite an interesting event to go to one year for those who struggle with present ideas. Our concrete track ended near Lilley farm, we next had a drink stop and headed south west down a sweep of open pasture land before crossing the road at Mapledurham and picking up a west direction bridleway that heads to Whitchurch via Hardwick House. We have walked this track before many years ago and it is remembered well by the walk leader for the Boze Down vineyard and alpaca farm further west. No time today for vineyard and alpaca viewing we turned off the track and followed a hilly hair pin bend type footpath into Bottom Wood. 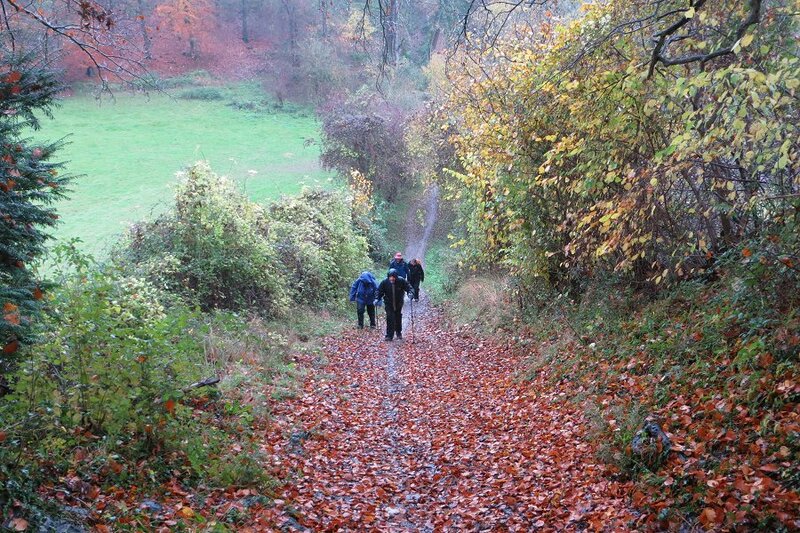 Here we had a lunch stop and had time to admire the autumn colours and leaf fall. After lunch we left the wood in a north-west direction exiting near Pathhill Farm and crossed an open grassed valley to Collins End. 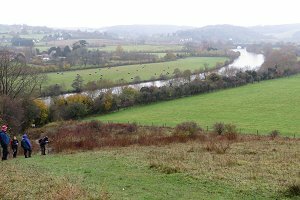 View of the River Thames from Long Ground plantation. In Collins End years ago we would have next gone to The King Charles Head pub but sadly this is now converted into a private residence so we instead tracked back into Long Ground plantation to come out to a good view point over the River Thames. After a pause for a drink stop and photographs we went down the fairly steep slope returning to the Hardwick bridleway. 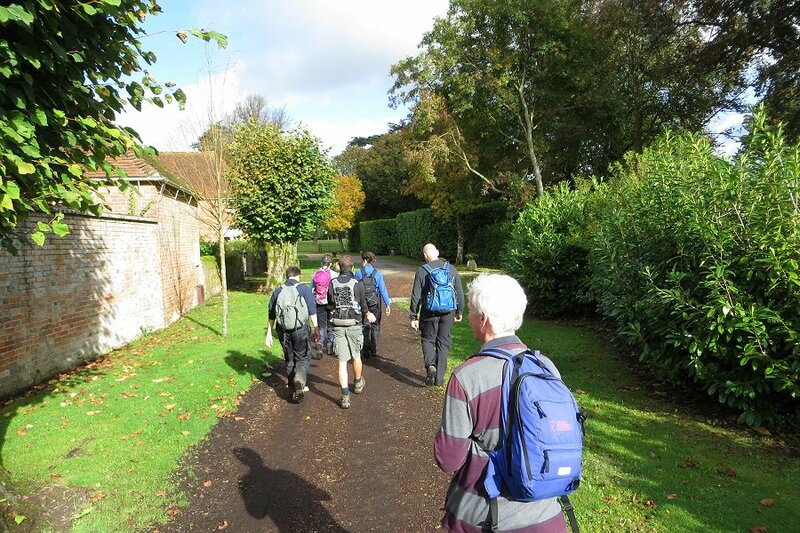 We then repeated a short stretch of the bridleway before turning right, past the Mapledurham house and followed a track back at the base of a hill and almost on a level with the River Thames. After approximately 2.5 km we turned off left up a slope, along a residential road and after one more left turn proceeded back across the recreation ground to the start. Thank you to Mike for leading the walk, taking the pictures and writing it up. A convoy of tractors on their way to Hambleden for a Remembrance Day Service. Leaving the car park shortly after 10:30am on Sunday 9th November, the sun was trying to break through the morning mist and promising another fine, warm autumnal day. Heading south down the lane towards the river we encountered a convoy of tractors, some towing trailers filled with people who cheerfully waved to us. 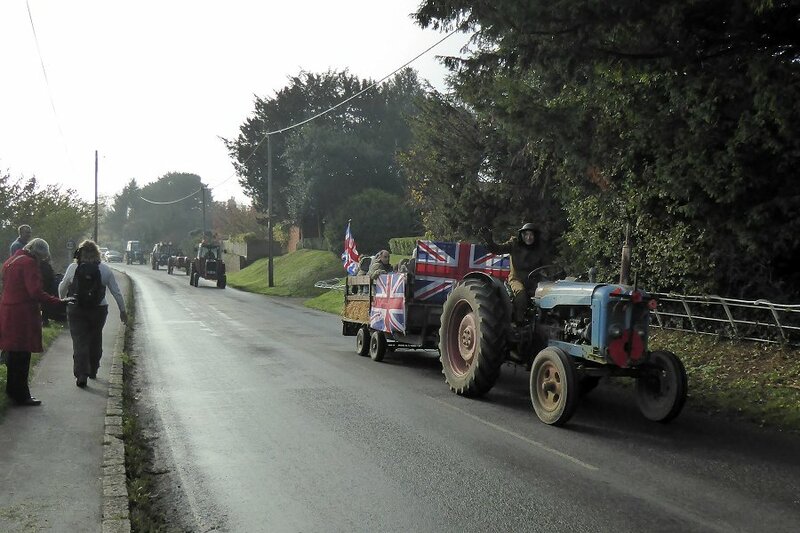 I assume that they were heading to a Remembrance Day service in Hambleden. 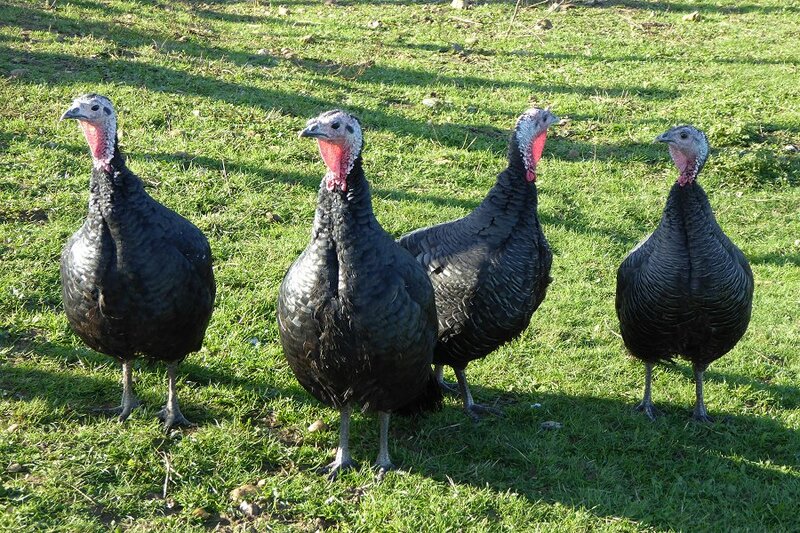 Turkeys at Woodside Farm. Do they know that Christmas is on the way? Crossing the Thames via the weir at Hambleden lock we headed along the tow path to Aston. Two large carved pumpkins and spiders webs covered in water droplets were an extra delight. Onwards down Remenham Lane, where we had our first glimpse of Temple Island. Approaching Aston, with the Flower Pot pub in sight. After pausing for a drink near the church we made our way up Remenham Church Lane to pick up a path across the fields and headed back towards Aston. More road walking up Aston Lane to pick up a pretty path, covered in fallen leaves. We meandered along the edge of fields and through small areas of woodland before crossing fields to the south of Woodside Farm. 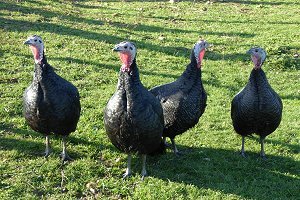 Today the turkeys were unsociable and the majority remained under their shelters. After following a well defined path through Remenham Woods, catching glimpses of sunlight through the trees we descended to the A4130 and crossed the bridge into Henley-on-Thames. Following the Thames Path from Henley back to Mill End. A sheltered area with seats, just south of the bridge, provided an ideal spot for lunch and gave those walkers wanting a hot drink the opportunity of visiting the Chocolate cafe. Three traction engines heading into town, over the bridge, provided entertainment and discussion while we ate lunch. 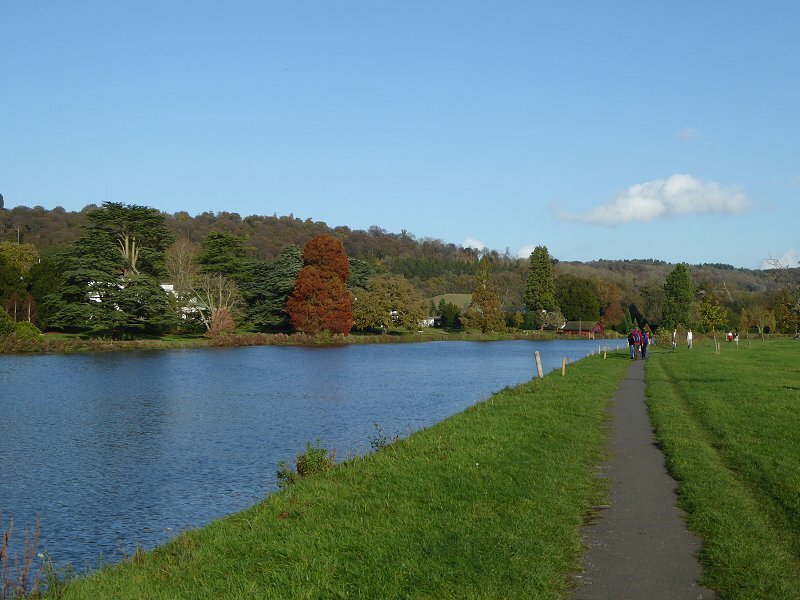 Our return journey was along the Thames path to Hambleden lock, where we lingered to watch the water rushing over the weir and forming large 'waves', turbulence and white foam. Such a contrast to the apparently still water by the mill. Thanks to Christine for leading the walk and writing it up, and to Sue for providing the pictures. 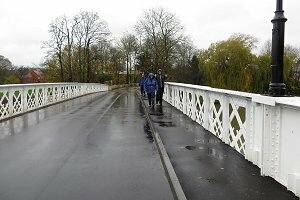 Crossing the recently refurbished toll bridge from Pangbourne to Whitchurch-on-Thames. Sunday 23rd November was wet. It had been raining quite heavily since Saturday afternoon and hadn't stopped overnight. But the weather hadn't put everyone off. There were five of us on this walk, armed with waterproofs and determination. On leaving the car park in Pangbourne, we crossed the recently refurbished toll bridge into Whitchurch-on-Thames. From there we followed the B471 through the village and up the steep hill the other side until we found the turning on to the lane that took us to the Thames Path. Once off the lane, there were some steep footpaths, which had become quite muddy with the rain. The Thames Path takes a dip and rises again before reaching Hartslock Wood. The Thames Path on the Whitchurch side is quite hilly. It takes a steep dip and rises again before it becomes parallel with the Thames. As the Thames comes into sight, the path is 35m (100ft) above the water with a steep tree-lined bank. The path gradually descends as it follows the Thames and was only 5m (15ft) above the water when we left it and took the steep path up to Hattonhill Shaw. There is a bench at the top of the hill, so we stopped to admire the view of the Thames, with Lower Basildon on the opposite side and Rottendown Hill Plantation visible behind the railway bridge. View from Hattonhill Shaw, with the Thames and Lower Basildon in view. 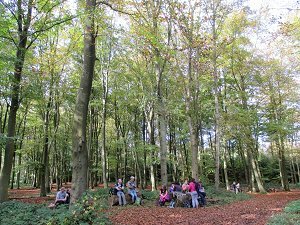 We followed a quiet lane uphill to Primrosehill Shaw and then to Great Chalk Wood, where we stopped for our picnic lunch. We ate our packed lunches while standing as the ground was too wet for sitting. Then we continued our walk, past Stapnall's Farm and on to Cold Harbour, where we missed our turning, distracted by a large puddle through which we were wading. 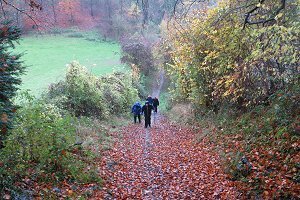 We had to wade through the puddle again to get back onto our route, which crossed Furzemoor Plantation and then along a narrow fenced path through a private wood before emerging by Beech Farm. Crossing the farm, we came out onto the B471 again, just north of Whitchurch-on-Thames. Following the B471 back down into Whitchurch-on-Thames. There is a footpath under all those leaves. From here we retraced our outgoing route through the village, over the toll bridge into Pangbourne and back to the car park. See our route on Bing Maps. The tea, coffee, hot-chocolate and slices of delicious cake were well received by us as we sat around our table and gently steamed in the warmth. 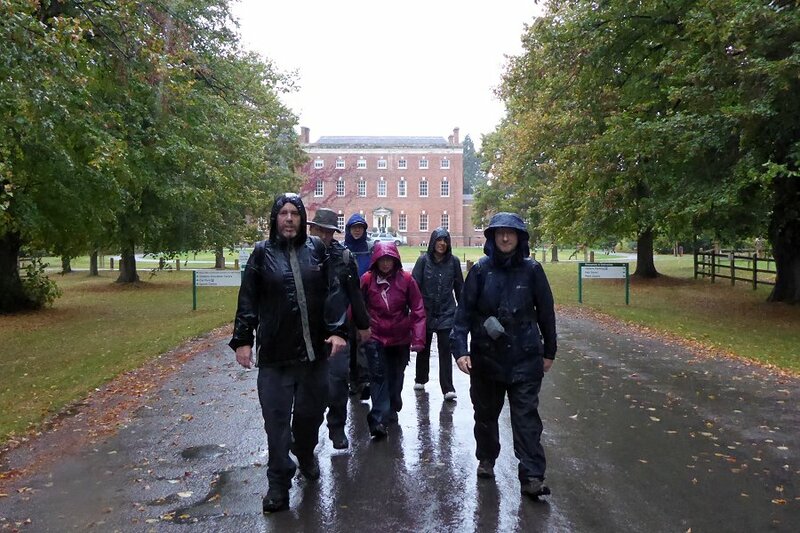 Ironically the rain stopped once the walk had finished. 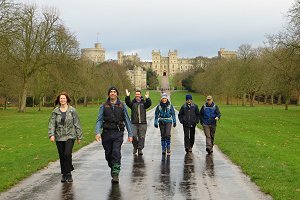 On Sunday 7th December, seven of us gathered in Windsor for an eleven mile walk led by Greg, who has lived in the town for most of his life and knows plenty of good walking routes in the area. We started from the public car park at the end of Alma Road and headed north-east into the park on Goswell Road. There was a fun-fair in the park but it wasn't open yet. From there we took an alley way that emerged onto the High Street, just on the corner of Windsor Castle, which we followed as far as Park Street and joined The Long Walk in Windsor Great Park. 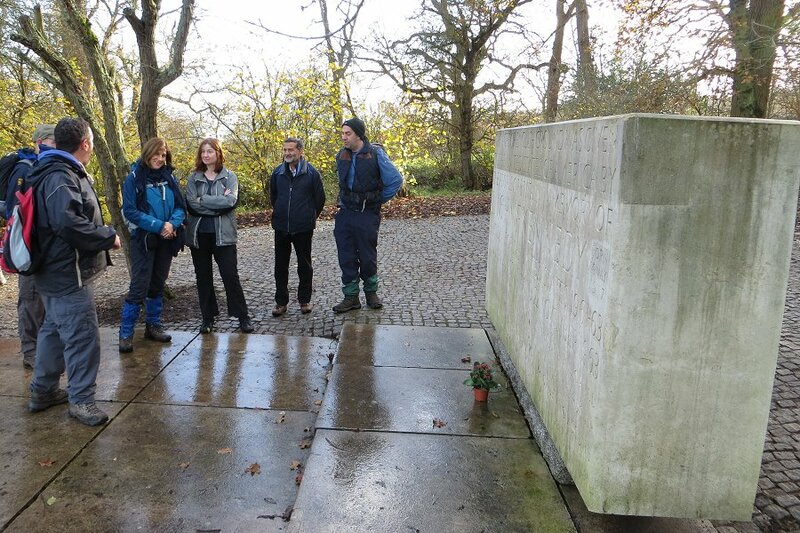 Looking at the Memorial for John F. Kennedy at Runnymede. This is the 2½ mile straight road that leads from Windsor Castle to the statue of King George II at the top of Snow Hill. This road is not open to public vehicles and so we mostly came across joggers and other walkers. However we were passed at one point by a car - being driven by Her Majesty the Queen! At the foot of Snow Hill we turned eastward, heading towards Bishopsgate where we left the park and followed public roads taking us towards Runnymede. We met Father Christmas when we got to the pub. Taking a footpath that descended Cooper's Hill to the River Thames, we stopped to look at the British memorial for U.S. President John F. Kennedy - a hefty Portland stone tablet erected in 1965. 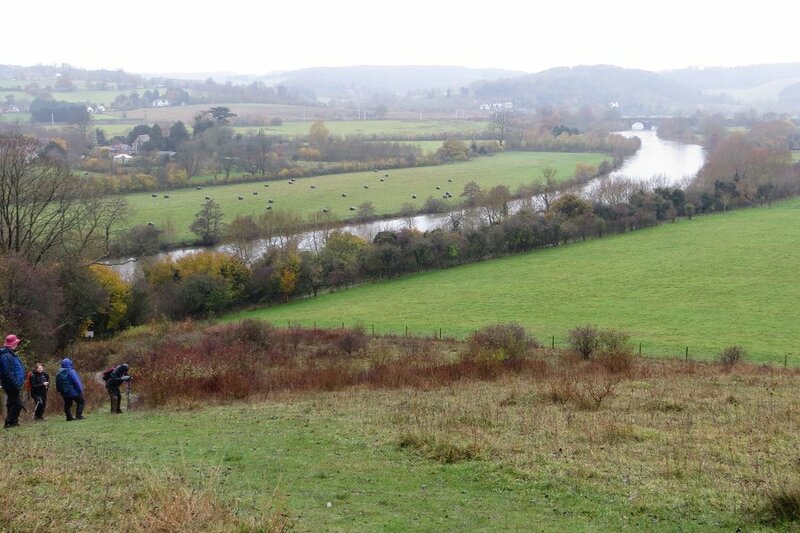 Joining the Thames Path near Magna Carta Island, we followed the Thames heading north-west. Just after passing Runnymede House, we stopped along the Thames Path where there were some benches to sit on while we had our packed lunches. After lunch we popped in to the Bells of Ouzeley pub for a drink. 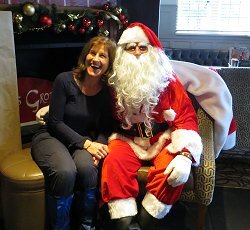 After getting our drinks from the bar, we saw Father Christmas sitting all by himself. One of us decided to sit with him and put a smile on his face. Eton Bridge and a traffic jam of swans on the River Thames. Drinks drunk, we set off on the second half of our walk. Re-joining the Thames Path we followed it as it meandered north and west back to Windsor. Along the way, the path changed from one side of the Thames to the other, at the Albert Bridge and back again at the King Edward VII Bridge. We finally left the Thames Path when we reached Eton Bridge. (The path crossed the bridge, but we didn't.) Making our way back through the park on Goswell Road, the fun-fair was now quite busy, and we finished the walk back at the car park on Alma Road. See our route on Bing Maps. The walk finished quite close to where Greg lived, and he invited us in for a cup of tea and a mince pie, which was a very sociable way to finish a pleasant 11¼ mile walk. Sipping mulled wine on top of Ambarrow Hill. 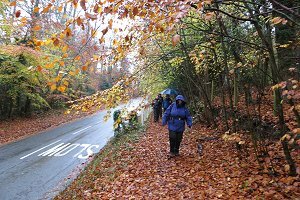 Eight of us gathered by Crowthorne station on Saturday 13th December for a nine mile walk around Crowthorne and Finchampstead Ridges. The weather was cold but sunny, with some frost lasting all day in shaded areas. We set off on a footpath that followed the railway line to the south, and then crossed the railway line into some woods. We walked up the short but steep path to the top of Ambarrow Hill, a natural hillock once thought to be an ancient burial mound. 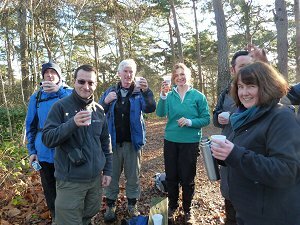 Our leader, Sue, had brought along some mince pies and mulled wine, in which we indulged at the top of the hill - a very pleasant form of refreshment on this crisp, cold morning. Watching (and photographing) the Egyptian Geese on Horseshoe Lake. This walk was a repeat of the first walk that Sue led for us, except that we weren't able to follow the intended route the first time due to flooding. 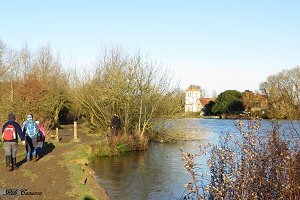 This time we were able to follow the part of the route that took us along the Three Castles Path, past Horseshoe Lake and along the banks of the River Blackwater. We stopped briefly to admire the Egyptian Geese that were congregating around Horseshoe Lake. 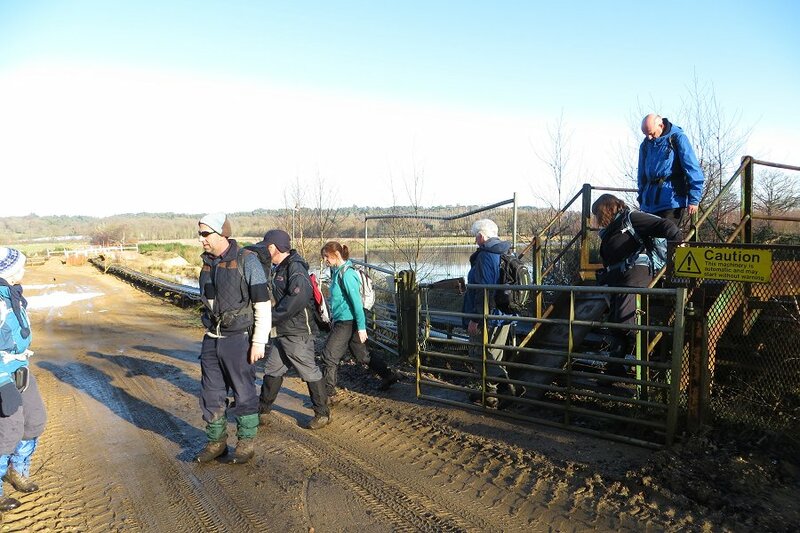 Then we headed west on a footpath between the river and Moor Green lakes, with its sand and gravel works. Crossing the B3016 Longwater Road, we continued to follow the path that had been totally submerged when attempting this walk last February. Crossing the conveyor belt for the Sand and Gravel works at Moor Green Lakes. Passing through the outskirts of Finchampstead we arrived at the church on the hill, by which was a small green and a pub. We stopped on the green to eat our packed lunches before popping into the pub for a drink. There was a log fire with an vacant leather settee next to it. It wasn't vacant for long! Suitably warmed and refreshed we continued north-east across fields and along footpaths, eventually looping round to the south again. Crossing the busy B3348 we followed a quiet lane down into a dip before heading up a footpath onto the pine-wooded Finchampstead Ridges, where we stopped on another hillock. 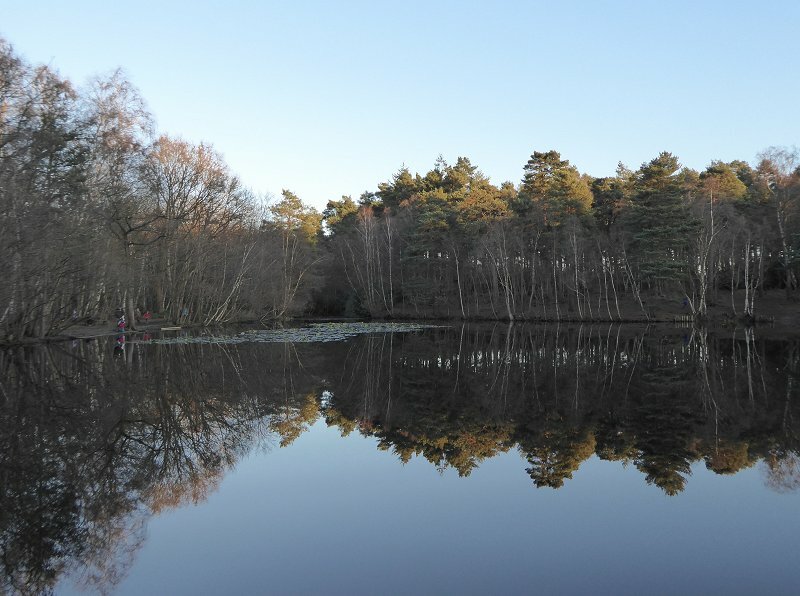 Heath Pond (or is it Kiln Pond) north of Finchampstead Ridges. Here we finished the remaining mince pies and mulled wine while sitting on a bench in the afternoon sun. 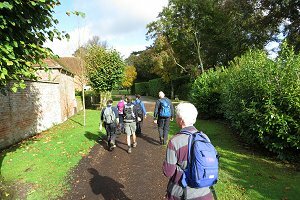 We continued our route, crossing Wellingtonia Avenue and taking another footpath north again, through woodland to Heath Pond. Following the edge of the pond around, we completed our walk on a very slushy footpath (Heath Ride) that headed south-east back to Crowthorne followed by a short bit of road walking to the Railway Station. See our route on Bing Maps. The sun was just setting as we finished and we all agreed that it had been an excellent walk. 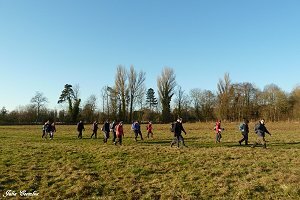 Opinion was possibly swayed by the mince pies and mulled wine - something we don't often get on our walks - but the winter sunshine definitely helped make the landscape look impressive. Walking through a slightly soggy field in Medmenham. 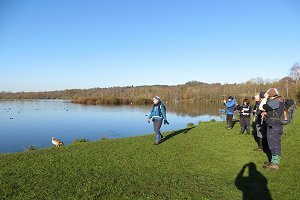 The first Sunday after Christmas saw nineteen of us out for a walk around Marlow and Medmenham. The weather was cold but sunny. In fact many of the puddles were frozen. 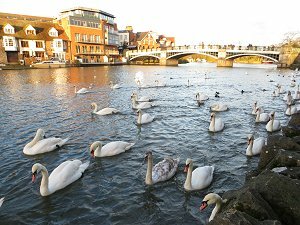 We set off from Marlow along Pound Lane, weaving through the western edge of the town before crossing the A4155 Henley Road and heading out into the countryside on the Chiltern Way. 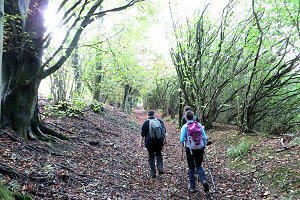 Passing through fields and farmland, we then entered Davenport Wood where we branched off the Chiltern Way and headed south-west through Hollowhill Wood and Hog Wood. 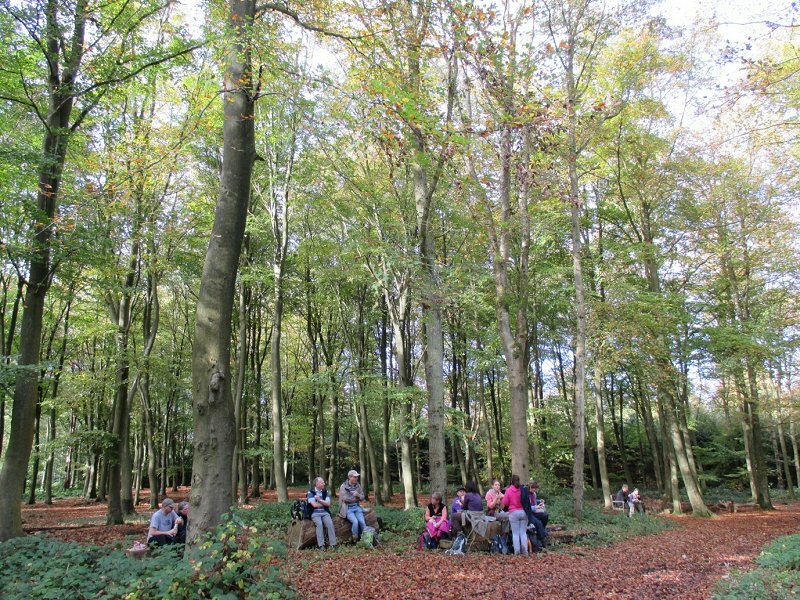 Continuing on undulating woodland paths, we stopped in Millbank Wood for our picnic lunch. A handy fallen tree provided us with seating. Ducks sitting on a fallen branch in the Thames near Hurley Weir. After lunch we followed a footpath down to the road to Medmenham. We passed the Dog and Badger pub that we'd been to for a social event a couple of years previously. It was closed for refurbishment, so we didn't pop in for a pint. Instead we crossed the A4155 Henley Road again and headed south through Medmenham. Turning east and then north-east, we crossed a rather waterlogged field. Most of the puddles were frozen but cracked and crunched as we walked over them. Occasionally a boot would sink into the icy water below, resulting in that foot-chilling feeling. 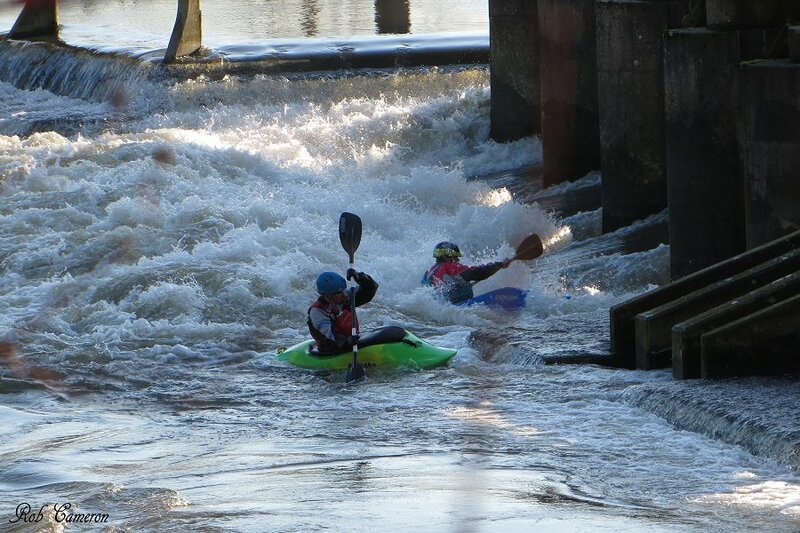 Two canoeists trying to beat the current at Hurley Lock weir. Briefly reunited with the A4155 Henley Road we took a lane heading east to the Danesfield Hotel and the River Thames. We followed the tow path for the short distance to Hurley Lock. 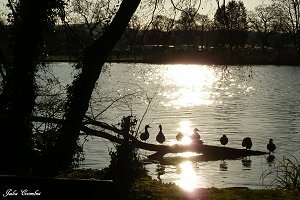 On the way we saw what looked like an identity parade of ducks lined up on a fallen branch, silhouetted by the low sun. Hurley Lock is on the other side of the river, but the weir was our side. There were a couple of canoeists trying to out-paddle the fast-flowing water pouring over the weir! I suppose that's one way to burn off the Christmas calories. The footpath left the river bank and headed north, passing through a tunnel. With no artificial lighting, we were lucky not to encounter any obstacles in the tunnel. Approaching Marlow on the Thames Path, we could see Bisham on the other bank. Emerging from the tunnel into the daylight, we turned east and passed an elaborate golf course and through some farmland before joining the Thames Path near Temple Lock. 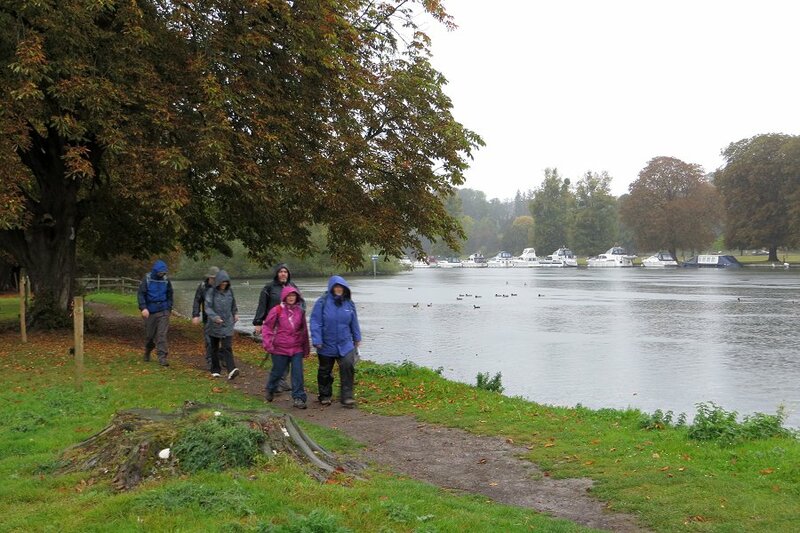 We followed the Thames Path for about a mile back to Marlow where the walk ended. On the way we had some lovely views of Bisham on the opposite bank of the river, which was now bathed in the low afternoon sunlight. See our route on Bing Maps. Arriving in Marlow, we were overrun by families out enjoying the excellent winter weather in Court Garden Park. When the walk finished, we split up with some of us going for a pint, others going for tea and cake and the remainder going straight home.